I didn't do too well with my habit tracker for March. 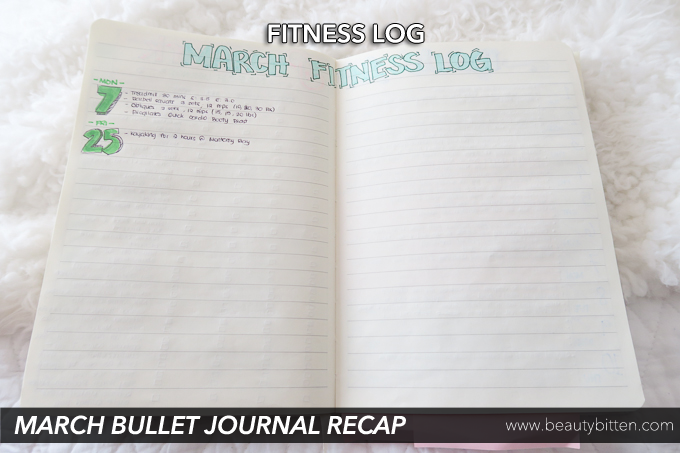 As I've mentioned in the video, I was having a rough few weeks in March, and it's somewhat reflective in my bullet journal. I wasn't waking up early as planned, didn't really exercise, and haven't been drinking my seven to eight glasses of water. I'm planning to change this attitude for April and continue to try to live a healthier lifestyle. I like to see and remember what I ate for the day. To me, food can spark up memories. I sometimes also tie certain things that happened with the food I ate that day (if that made any sense). I'm not much of a breakfast person, but occasionally, I'd want to whip something up delicious to start off my day. I had great expectations for this page when I set it up before the month started. Sadly, I didn't get to fill up this page as much as I wanted to with all the work-outs I imagined I would do. I think part of why this page didn't work out for me was because I just had a blank page. There was really no structure or format where I can fill things in. The page didn't excite me or even really motivate me to work out at all. I almost have forgotten I had this page just because it was blank. 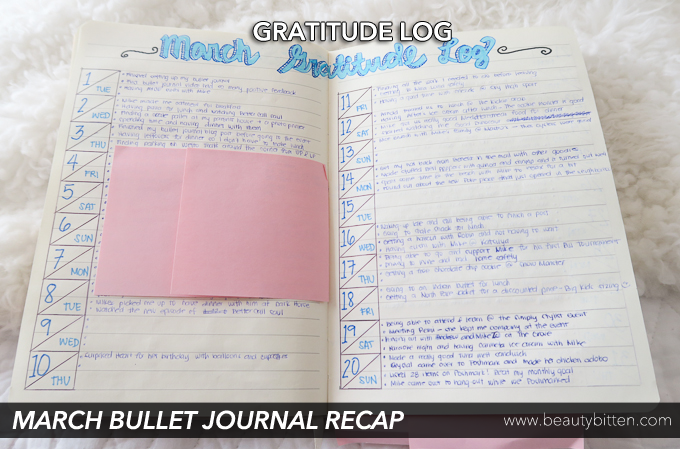 I missed a few days writing in my gratitude log. But that's ok. I'm not going to beat myself up for the days I missed. 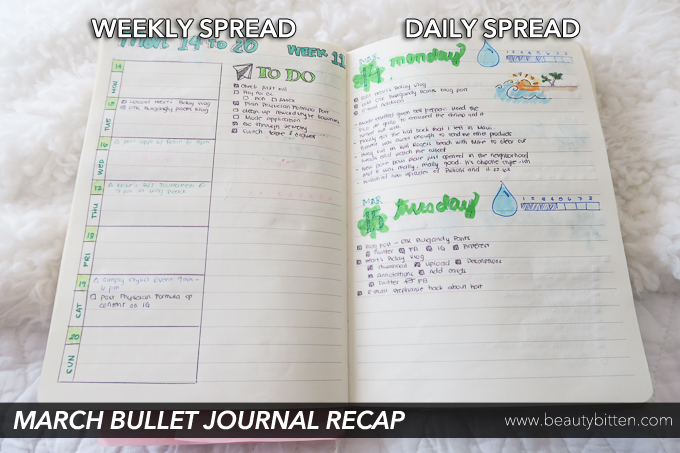 This spread will always be a staple in my bullet journal. 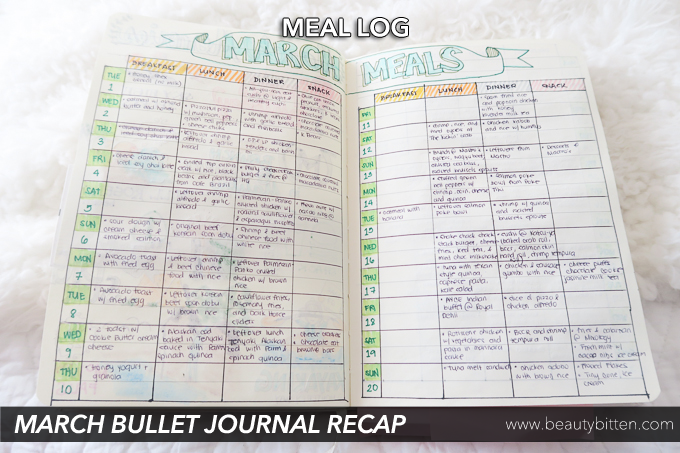 I tried to incorporate the weekly spread in my bullet journal for March. 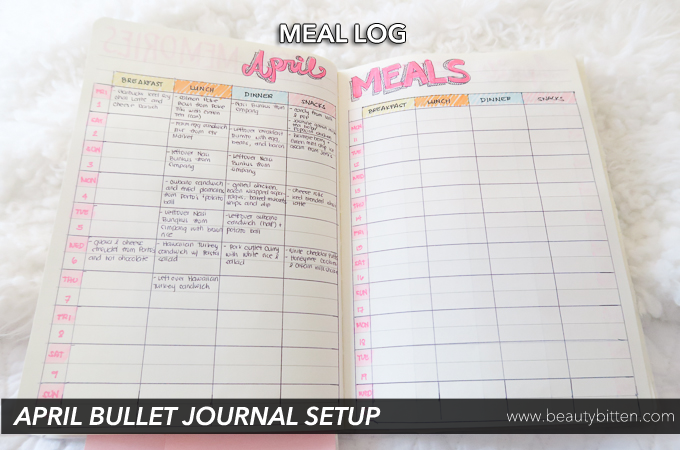 At first, I really liked the idea because it allowed me to plan out all my appointments or events I have to attend and things I have to accomplish for the week. I really like it for having a to do list for the week. However, I thought that it was also a little bit redundant since I already have my monthly spread for that. 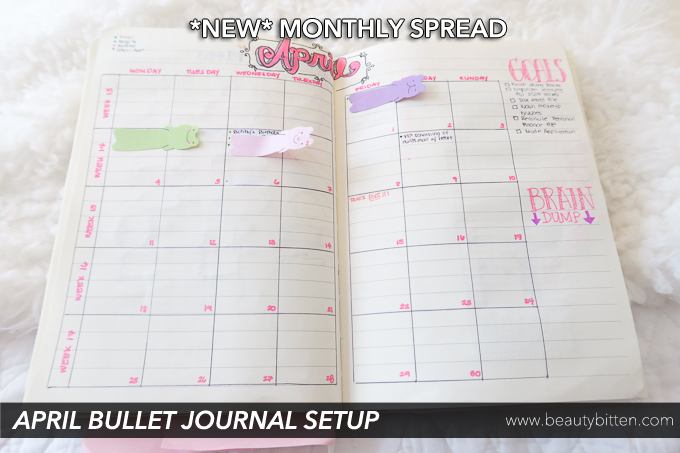 It just kind of ties to my old monthly spread not having enough space to jot down my appointments, and the layout also being a little confusing and not really intuitive. 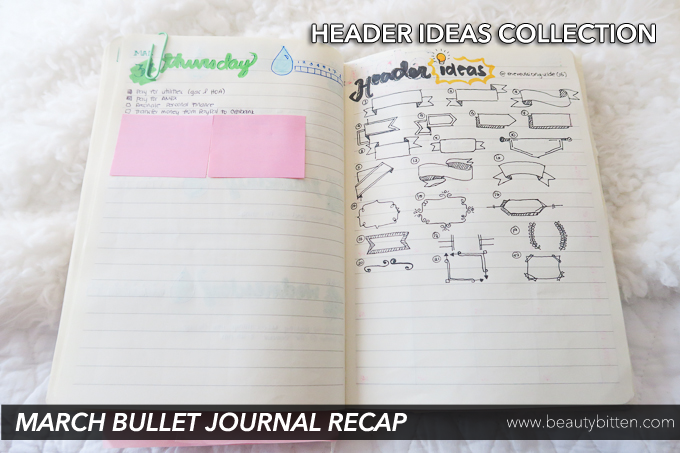 I started dedicating a page for header ideas for my bullet journal. I found myself always checking and scrolling down therevisionguide's Instagram page for that. I figured to just have a page with my favorite headers that I can easily reference when I want to change my header up a bit. 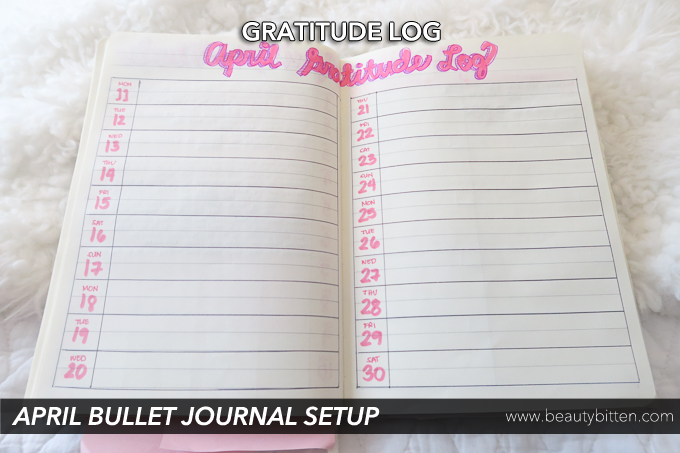 Here's how I've currently set up my bullet journal for the month of April. 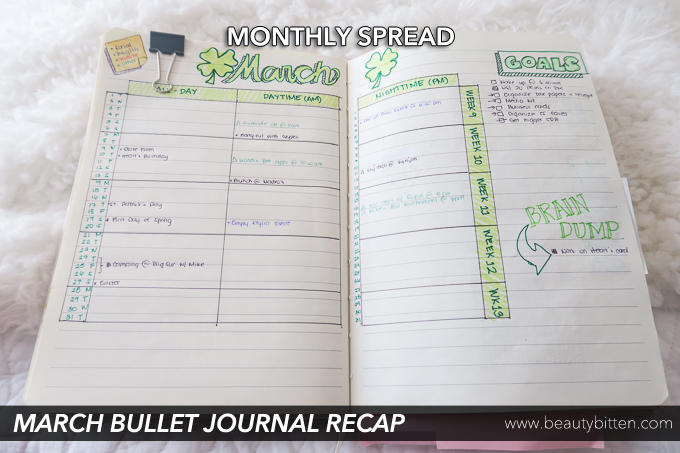 There were a few changes on some of the monthly spreads that I've previously used. Like I mentioned earlier, I wanted to change the look and feel of my monthly spread. I adapted the calendar approach for it to give me more room to write down any appointments or events for the month. 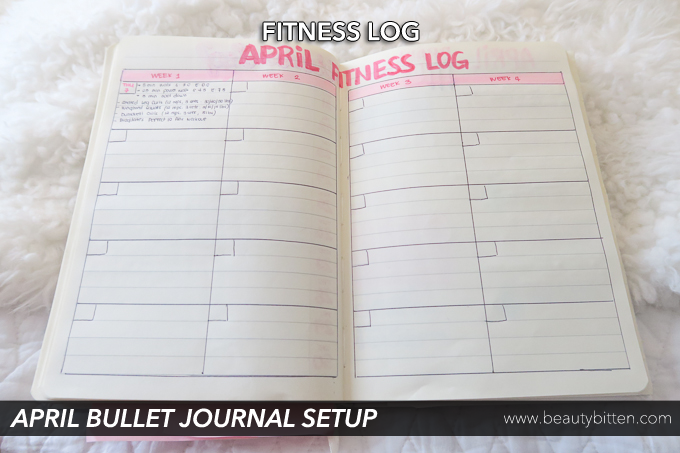 Here is the new layout for my fitness log for April. I split up the month into four weeks and gave myself room for five work-outs a week. This is even being optimistic since I haven't really worked out five times a week, but you know, just in case ;). I wanted to ease into working out. I didn't mark any dates on this layout because it will all depend on when I can actually squeeze a work-out in. I know that I should plan for my work-outs, but I'm just making this page a little more flexible for my needs. I've set a goal to at least work out of minimum of three times a week. 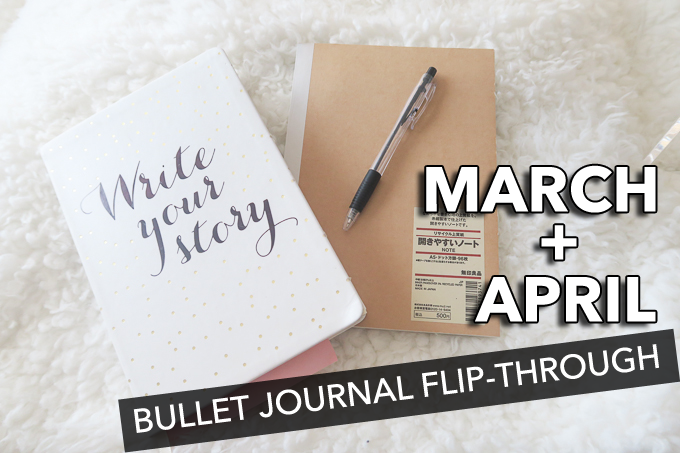 If you recall in my last bullet journal post, I dedicated a page in my bullet journal for my Poshmark listings. I've decided to not carry this over for April and move all my inventory listings to an Excel spread sheet. It was a little bit too much to maintain, and I figured that I'll be able to sort out and get a better idea of what's in my Poshmark listings by having it on Excel. This will allow me to monitor and categorize my inventory properly. 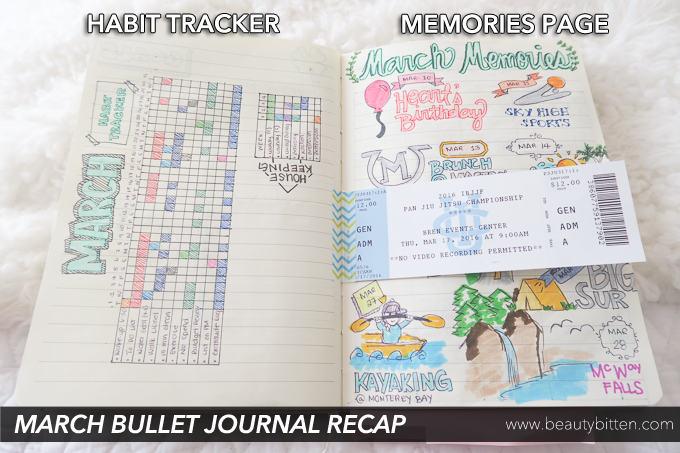 And that's it for a view of what's inside my bullet journal. Share in the comments down below what's your current favorite spread. 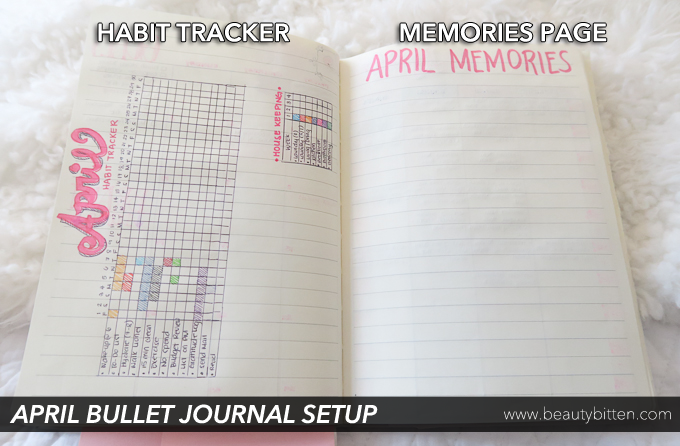 My favorite part is the Habit Tracker and Memories Collection! I really liked the idea of the column with "no spend" on it. I've been thinking of ways to keep track of my spending and this is an awesome idea! You are so organized! You can be a life coach!^^ Thanks for sharing this. I will suggest you add yoga to your regular routine. Doing yoga can help you to keep yourself young and energetic. This will help you to keep yourself calm and relax. Will help your immune system to keep in a good condition. You can try necessary yoga accessories. Their quality is really good and comfortable to use and wash.